These super versatile Roasted Veggie Quinoa Bowls are good hot, cold, eaten right away, or served as leftovers the next day. Add chickpeas and 1 Tbsp olive oil to a medium sized bowl. Combine until evenly coated. Place chickpeas on a parchment lined baking sheet in one single layer. Sprinkle with salt. Place chickpeas in the oven and roast for 40 minutes. While chickpeas are roasting, combine 2 Tbsp olive oil with sweet potato, onion, carrots, and Brussels sprouts. Combine until evenly coated. Place vegetable mixture on a parchment lined baking sheet in one single layer. Sprinkle with salt. Place vegetable mixture in the oven and roast for 30 minutes. When vegetables and chickpeas have about 20 minutes left, cook quinoa as directed. 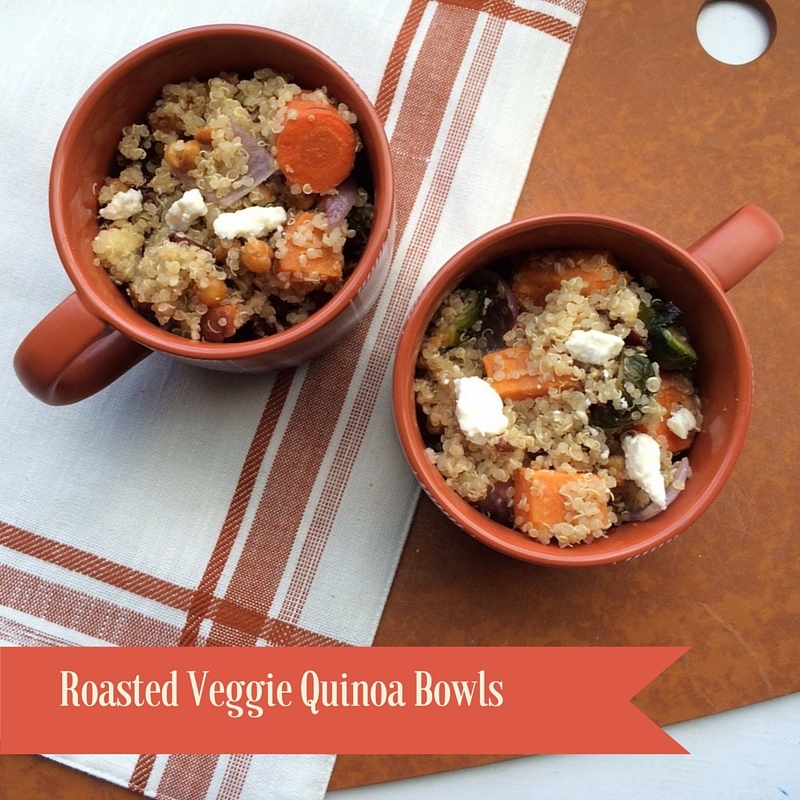 Once vegetables, chickpeas, and quinoa are finished cooking, mix together in a large bowl. Add cranberries, pecans, and Feta cheese. Mix well. For maximum flavor, consider cooking quinoa in broth of your choice in place of water. Remember to cook vegetables into pieces of approximately the same size. This will ensure everything cooks through at the same time.